It was an early Saturday, we were roaming around Brooklyn killing time before Grimm had their grand opening of their new brewery. Looking for food, and having ended up at the Mc Donalds there one too many times, we ventured on a bit of a walk. We wantered into Ichiran I got excited, I realized and said out loud "Oh this is the private booth place!" We were given our numbers (the assigned single booth numbers they tell you to sit at) and sat at booth 29 and 30. The place was empty as we were the first people to get there so I took the opportunity to snap a few photos. So yes, there is only one item on the menu, and yes it is $18. But its much more about the experience. I loved the idea of choosing my salinity, noodle, and toppings in a very personal way. I must admit though, it took me a bit to figure it out. The restaurant helps you embrace eating alone but also helps the diner concentrate on the flavor of the food in front of you. Although it does seem that perhaps its just an excuse to eat alone with out public judgement, or perhaps an excuse to just be messy eating ramen, I do appreciate the idea of concentrating on the flavors of your food. After all, if we don't take the time to think about what we are putting in our mouth and appreciating it then we might as well eat rice cakes for the rest of our days! JS! Bottom line, if your are really into ramen (as my partner Otto is) you should stop at Ichiran. 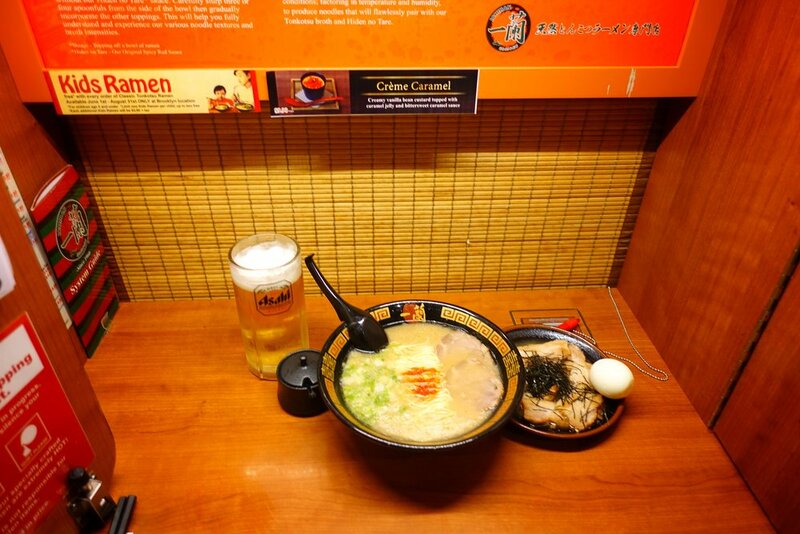 The ramen is good, the experience is one of a kind, and we enjoyed it.